Which is the best replacement battery for automatic start-stop systems? The energy consumption of modern vehicles is increasing and the increasing number of electronic components and comfort systems puts a great load on the battery. In addition, legal requirements to reduce CO2 emissions forced manufacturers to introduce automatic start-stop systems. Only high performance car batteries such as EFB or AGM batteries can deal with these increased requirements and provide a stable power supply in the vehicle. A battery for a start-stop system can only be replaced with a battery of the same type. In the case of an EFB battery, an upgrade to an AGM may be advisable. 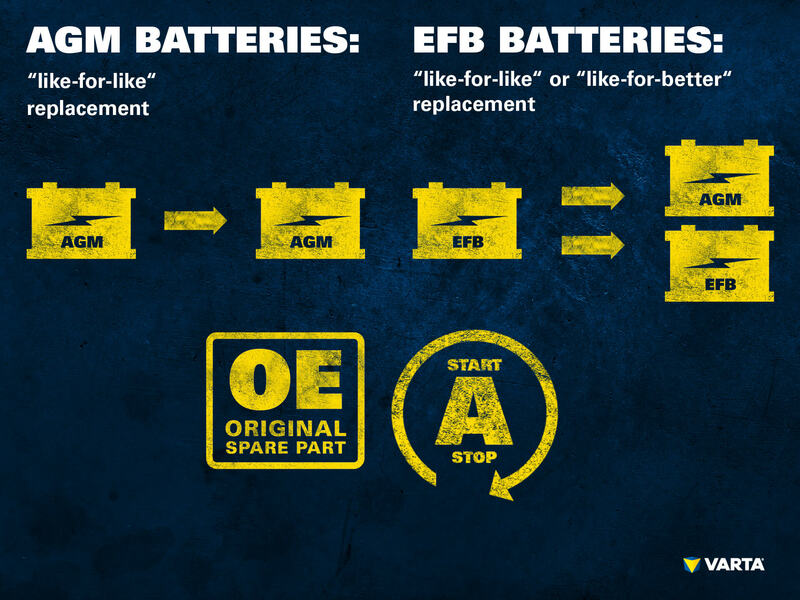 However, under certain circumstances, an AGM battery may be suitable for vehicles without start-stop technology. In the VARTA Partner Portal our partner workshops can quickly find the right battery. The VARTA battery search is also a helpful tool for our end customers. Below, we have summarized the various battery technologies and the right replacement batteries, as well as why an upgrade can be worthwhile. Conventional lead-acid batteries are tried and tested products, which have been proven in millions of vehicles for decades. These days, almost all batteries are maintenance-free. Beyond a regular check by your workshop in order to detect an imminent failure, no other maintenance is needed. 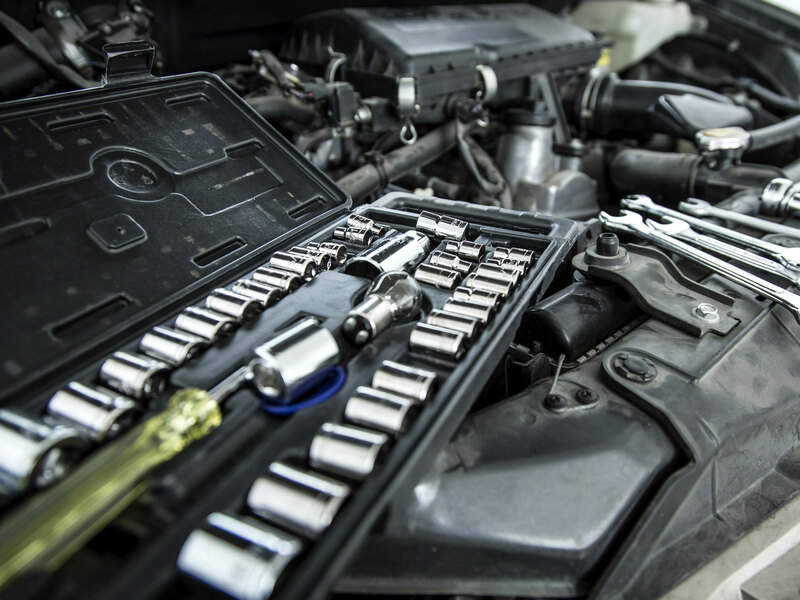 If an older battery is not maintenance-free, it must only be serviced by specialists. With good care, a lead-acid battery can last for many years and they are still widely used in vehicles without start-stop systems and with a moderate number of electrical components. EFB batteries are higher performance versions of conventional starter batteries. Thanks to the enhancements surrounding the plates with a polyester scrim and an improved formulation of the active material, these can be used more effectively. This also results in a slower increase of the internal resistance of the battery over its lifetime than is the case with a conventional battery. EFB batteries are widely used in vehicles with entry-level start-stop systems, usually without recovery of braking energy. AGM batteries score with their high performance and durability. In an AGM battery, the glass fiber mat which is used as a separator absorbs the electrolyte, which makes it impossible for the battery acid to leak. The plates of AGM batteries are installed with a defined compression. This ensures an optimal connection between the acid and the plates over the entire life of the battery. In addition, the compression prevents the loss of active material and makes the battery especially robust for demanding applications. AGM batteries are used in vehicles with advanced automatic start-stop systems and recovery of braking energy. Starter batteries with AGM or EFB technology are designed to meet the requirements of vehicles with start-stop systems. Normal car batteries cannot deal with the high demands which occur due to discharge during the stop phases. Replacement with a normal battery instead of an AGM or EFB, results in rapid deterioration of the battery, and a breakdown is inevitable. For optimum function, a battery must be used, which is compatible with the vehicle’s battery management system. An upgrade from an EFB to an AGM battery is possible and increases the efficiency of the automatic start-stop system and results in increased efficient fuel consumption. Cars with automatic start-stop systems and energy recuperation create heavy demands on the battery. An AGM battery can also deal with the large number of cycles which are caused by the automatic start-stop system and is also suitable for charging with regenerative braking energy. An EFB battery is usually used with a higher charge level so that storage of energy from recuperation is not possible, or is only possible to a limited extent. A powerful AGM battery with OEM quality guarantees high reliability and better driving experience. When is an upgrade worthwhile? Modern compact and medium-sized cars are often equipped with many electronic assistants and comfort features such as heated seats or mirrors. As well as these, there are components such as navigation systems and central locking systems, which are often standard features, even in small cars. Premium class vehicles, SUVs and sports cars are equipped with even more electrical components, which the battery must supply in all driving situations and in all weathers. In such cases, an upgrade to an AGM battery may be worthwhile, even for vehicles without automatic stop-start technology in order to ensure increased reliability. Many convertibles, vintage vehicles and second cars are often only used in summer and are mothballed for several months during winter. During this period, the battery is not charged by the alternator, so it is advisable to maintain the charge with a compatible battery charger. An AGM can be recharged much better and provides adequate capacity for longer, as acid layering and sulfation are less prone to sulfation due to the bound electrolyte. This ensures a successful start to the season. Does the vehicle have extensive electronic equipment? Is the vehicle equipped with additional, retrofitted electronic devices? Are devices, e.g. mobile phones, often charged in the vehicle? Do you often drive under extreme weather conditions? Do you often drive short distances or are often in traffic queues? Would you be prepared to pay more for a product with a better long-term benefit (service life)? If you have answered any of these questions with “yes”, an upgrade to an AGM is recommended. Find out more about when replacement with an AGM battery is worthwhile, even without a start-stop system.